Lastolite's VH Flip Bracket enables a camera to be quickly alternated between portrait and landscape orientations, all the while maintaining the same distance from a flashgun. This makes it ideal for those photographing social functions, where off-camera flash will be required for group shots and single/couple images. The bracket has a movable platform on which a camera is mounted, and this can be removed from its rails and screwed into a camera's tripod thread like a standard quick-release plate. There's also a thick rubber handle that's contoured for comfort, and an arm that can be extended around 11 inches to position the flash further away from the camera. At the end of the arm there's a platform with a hotshoe-style fitting to accommodate a flashgun. This contains two springs and a clamp to accept a range of flash feet, although these springs easily pop out of their holes and are so small that it's all too easy to lose them. If these stay in place, the flash can be securely fixed into position with the clamp, and moved around without any danger of it falling off. Moving from one orientation to the other is simple: you simply depress the small lever underneath the platform and either pull or push the camera to the other position. 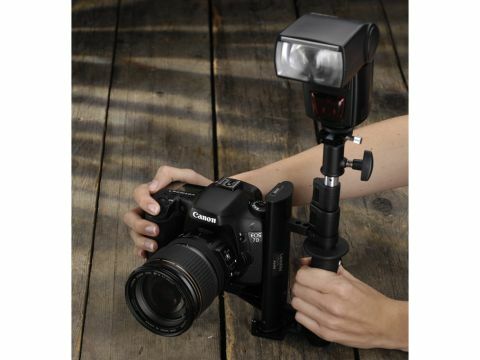 Depending on how far up the flash is positioned, you can even use the unit with just one hand around the camera. It may not be something everyone would benefit from, but it's a clever and useful device for those who need it.